George Washington tells us that the spirit of party is a part of our nature, yet it ought to be kept under total control. So what part of our nature is it? It is the part that demonstrates itself in our biases and prejudices. These take the form of “my gang is better than yours” which is soon translated to “my gang is right (or good) and yours is wrong (or evil).” This is the basis first of pride, then of hate, and sows the seeds of war. The party mentality includes the win/lose philosophy which supposes that we need to contend with (and ultimately defeat) an enemy. After all, we are better than they are and can prove it with force. We all have biases and prejudices. To demonstrate this, just replace the word gang in one of the phrases with the word team, neighborhood, high school, religion, race, nation, gender, etc. The party systems of government are based on force and defeat of an enemy or at least the defeat of his position on a certain issue or bill. The spirit of party is the beginning of war. On the other hand, true freedom must be built on the spirit of peace and cooperation. Communication is a major casualty of this win/lose paradigm. In their efforts to oppose other parties, members of one party quit listening to what is being said by anyone of another party except to gather ammunition for a rebuttal or some less noble purpose. The last thing a loyal party member would want to do is acknowledge any validity in the other party’s point of view on any subject. Members of other parties are perceived as enemies and therefore must be considered evil and totally unworthy of any admiration or even respect. Candidates also don’t want to be labeled as thinking like an opposing party on any topic. They therefore are forced to take the opposing view just to oppose–no matter what their position really would be if they were actually to analyze the situation prior to taking that stand. The contention between political parties only validates the statement that “the first casualty of war is truth.” So essentially, in a government based on a party system, there is continually a state of low grade civil war. Is it any wonder that George Washington said that in popular governments the spirit of party “is seen in its greatest rankness and is truly their worst enemy”? 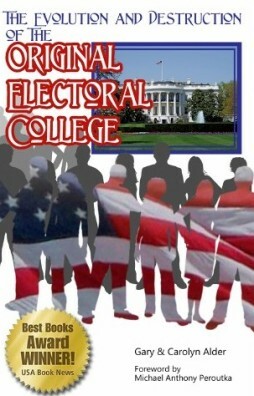 Yet that was exactly what took place as presidential candidates deserted the candidate selection methodology specified in the Constitution (Electoral College System), and started to “run” for the presidency (popular vote system). Early in the year 1795, the two great parties of the nation became firmly arrayed against each other on the question of providing a successor to General Washington. Mr. Adams was taken up by the Federalists, and Mr. Jefferson was undividedly designated as the Democratic-Republican candidate. The contest was conducted with great asperity. In fierceness and turbulence of character, in the temper and dispositions of the respective parties, and in the principles which were put in issue, the contest so strongly resembled those of which every generation since then has been eye-witnesses and actors as to render a description unnecessary. The issue was well-recognized. The struggle of the people against the party in power is always an unequal one, and was lost on this occasion. The majority, however, was inconsiderable. On counting the electoral votes in February, 1797, it appeared there were seventy-one for Mr. Adams and sixty-eight for Mr. Jefferson.